Mobile Future is an association of cutting-edge technology and communications companies and a diverse group of non-profit organizations, working to support an environment which encourages investment and innovation in the dynamic wireless sector. Our mission is to help inform and educate the public and key decision makers in business and government on the broad range of wireless innovations that are transforming our society and the nation’s economy. The list of members includes big players such as AT&T, Verizon, Alcatel-Lucent, Cisco, Ericsson, Samsung, and Qualcomm as well as some obscure non-profits, e.g. Foundation for Advancing Alcohol responsibility and Hispanic Chamber of Commerce of Minnesota. Your blogger is actually a volunteer for one of the nonprofit that is an MF member and has absolutely no idea why this organization is interested in mobile spectrum and involved in this lobbying effort except if one of its board members is with the same PR firm MF uses. To facilitate the periodic review of existing significant regulations, independent regulatory agencies should consider how best to promote retrospective analysis of rules that may be outmoded, ineffective, insufficient, or excessively burdensome, and to modify, streamline, expand, or repeal them in accordance with what has been learned. Such retrospective analyses, including supporting data and evaluations, should be released online whenever possible. Often a radically new technology comes from a small, privately-funded start-up. Its only product may be the one awaiting Commission approval. These companies may lack the resources to survive a lengthy FCC proceeding. I do not disagree with much of what she writes, however, there are real limitations to the 47 USC 161 biennial review process that I think she was referring to. The statute refers to review of “all regulations issued under this chapter in effect at the time of the review that apply to the operations or activities of any provider of telecommunications service”. In the past, the Commission has interpreted Section 161 in the narrowest possible sense to limit its work. Indeed, I recall during the Powell chairmanship numerous efforts were made by upper commission leadership to limit the scope of biennial review and keep it as narrow as possible so it would not be a distraction to the current agenda.
" the comments did not suggest that the rules should be repealed or modified because they are no longer in the public interest as the result of meaningful economic competition between telecommunications service providers. Accordingly, OET concluded that these comments were beyond the scope of the section 11(a) review". Thus a narrow interpretation of Section 11(a)/47 USC 161(a) was seen as a preferred alternative to considering the merits of the suggestion! This I have submitted to the FCC blog a comment stating that if they are serious about “retrospective analysis” they could start by looking at ALL the biennial review proposals in recent years that were dismissed for such bureaucratic reasons and consider them on their merits - not narrow interpretations of Section 11! But while we at at it, how about some action on the Wireless Innovation NOI (09-157)? Mitchell Lazarus writes in the Fletcher, Heald & Hildreth CommLawBlog this week about the end of the FCC’s software defined radio (SDR) rulemaking, Docket 03-108. “Not with a bang, but with a wimper” is a good way to describe it. Those of us who are Firefox users have made a judgment of the security of this open source software vs. the endless security problems of closed source Internet Explorer. The security of open source software if not a real issue. What is an issue is how slow the ancien regime at FCC was in keeping up with technology and keeping up with its “in box”. Telecom technology moves at Internet speed and excessive slowness discourages innovation and the capital formation needed to support it. Your blogger suggested in comments to Docket 09-157 that the Commission should delegate this type of noncontroversial policy issue to a panel of senior employees empowered by Section 5(c) of the Communications Act to make decisions. So far no one else has commented on this proposal. What do you think? But another issue here in the area of software security has nothing to do with open source software. At the recent SDRForum conference in Arlington (now called the Wireless Innovation Forum) I was on a panel discussion and someone in the audience asked why doesn’t FCC do more about the security of the software in software defined radios. 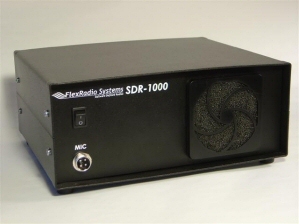 Indeed, with malicious software changes, SDR radios could do all sorts of malicious things to disrupt CMRS communications, public safety communications, etc. While I was at FCC some of us were concerned about this and considered safeguards. But the SDR Forum and its major members were very insistent that they were responsible people and would only sell SDR units that were difficult//impossible to load with malicious unauthorized software. I am certain that this was and still is the intent of the legitimate companies that are members of the SDR Form and its successor. BUT. FCC Rules do not apply just to them. The same rules apply to anyone who manufacturers or imports SDRs. There are sleazy foreign companies who have sold systems as antisocial as high power cordless phones that operate on air traffic control frequencies. Such firms would be happy to make an SDR that is approved by FCC with software for some benign function such as Part 90 use. Then they, or an affiliate, can sell through the Internet software that turns the unit into some nefarious use. Once large numbers are imported into the US, there is little in practice FCC can do about them. The fundamental problem about the SDR rules is they assume the manufacturer/importer is a “good guy” in all cases. This is not always the case. I am afraid other spectrum users may find out the hard way and am puzzled while CTIA, NAB and APCO have never been interested in this issue.